A condition that can mimic thoracic outlet syndrome and produces sensations of numbness or cooling within the extremities usually at the toes, fingers, tip of the nose, or ears. The patient’s response to cold temperatures (outdoor or by a coldpack) or stress often results in lack of sensation or numbness and tingling. In Raynaud’s disease, smaller arteries that supply the skin have narrowed and supply limited blood to the affected areas. It is more common in adults who live in colder climates.The symptoms of the disease depend upon the frequency, duration, and level of severity of blood vessel spasms that occur with temperature changes in this condition. 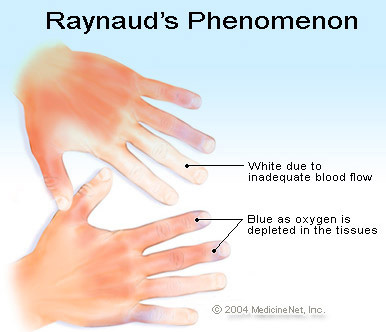 During a flare-up of Raynaud’s Disease, affected areas of the skin often turn white and then blue with the sensation of numbness. Occasionally, the flare-up can affect only one or two digits.